I found a seat in Panera with an inside/outside view and a relatively stationary victim. This was a fun list which had me relaxing and not using the same method every day. 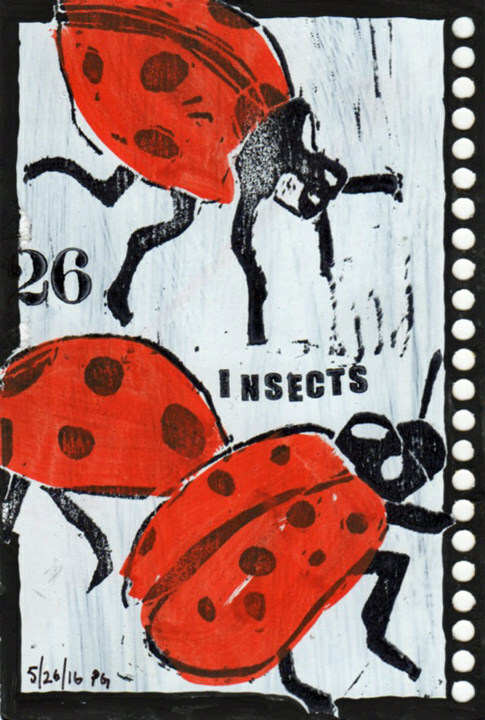 I carved 8 images, did a monotype, copied parts of two masterpieces, managed to slip in groups of people here and there and sketched everything, except the bugs, from direct observation. Phew. Now I can start catching up on the other things from May. Everyday in May 2016: Drawn from direct observation. Color added later at home. Materials vary. Acrylic paint; pencil, Sharpie Fine Pen; occasional use of Pitt Brush Pens; commercial letter and number stamps; StazOn pigment stamp ink. When the month is completed it will be bound as a book with a spiral coil. At the most opportune time I spotted a feather on the parking lot ground. I heard my mothers voice in my head telling me not to pick it up but I NEEDED a feather. I totally ignored all the microscopic life that was most likely teeming all over it. And, I didn’t get “the itches”. 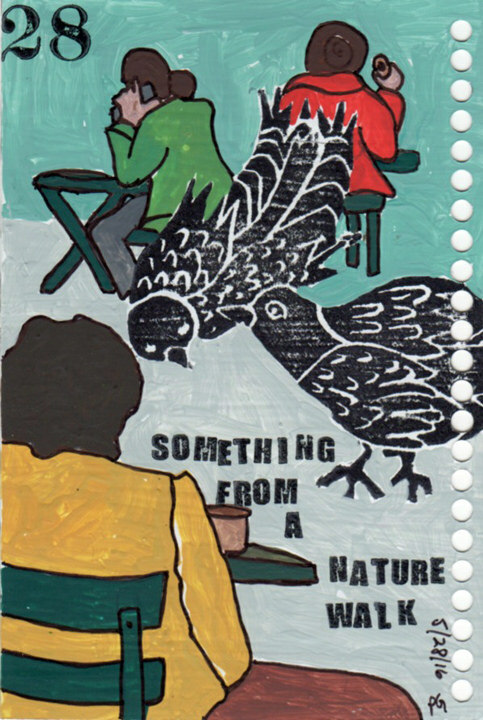 Everyday in May 2016: Drawn from direct observation. 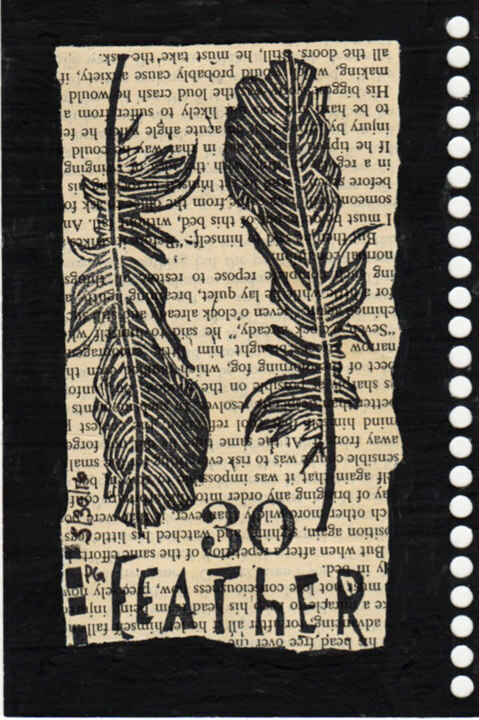 Feather and text carved out of Speedy Cut. Collage. Materials vary. 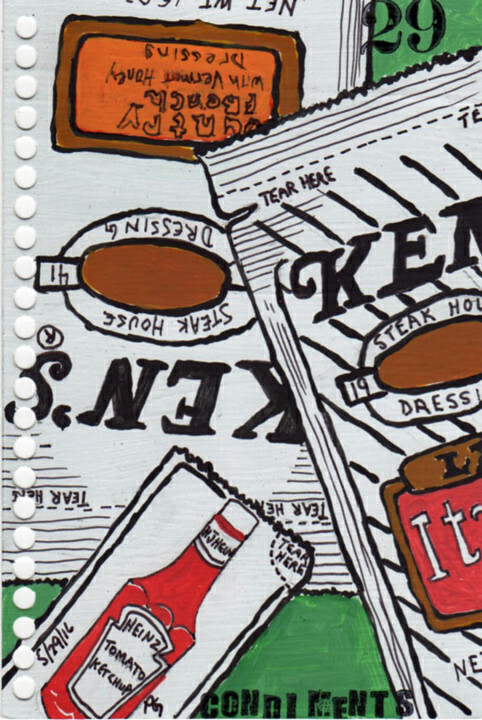 Acrylic paint; pencil, Sharpie Fine Pen; occasional use of Pitt Brush Pens; commercial letter and number stamps; StazOn pigment stamp ink. When the month is completed it will be bound as a book with a spiral coil. I found these packets in the fridge. Everyday in May 2016: Drawn from direct observation. Materials vary. Acrylic paint; pencil, Sharpie Fine Pen; occasional use of Pitt Brush Pens; commercial letter and number stamps; StazOn pigment stamp ink. When the month is completed it will be bound as a book with a spiral coil. I was hanging out in Union Square Park and spotted some pigeons (nature) and some lunchers. Have you ever tried to sketch birds scavenging for crumbs? Not easy. They gave up on me after awhile. I sketched in the pigeons but when I arrived home I decided to carve them out of Speedy Cut. I’m being facetious about this urban, middle of the city, park. It’s really a very cool place and I love to kill time there before I head downtown for Figure al Fresco. There are all sorts of people – from snazzily dressed executive types to junkies to chess players looking to make money to the turbaned tarot reader to doggies in the special dog socializing area to sketchers. There’s also a very extensive farmers market on Wednesday (I think weekends also) selling all sorts of healthy wholesome fresh things which means the park also contains housewives, children, school groups getting organically educated and hippies with cloth shopping bags. There are trees and lawns and tables and chairs you can move around and millions of benches so you can always find someplace to sit. There are also subway entrances which is mucho convenient. I do expect the place is creepy late at night though. 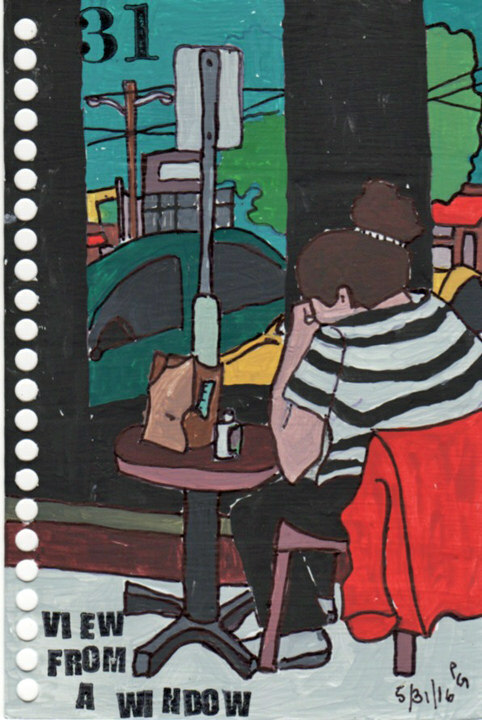 Everyday in May 2016: Drawn from direct observation and color added at home. Birds carved out of Speedy Cut later at home. Materials vary. Acrylic paint; pencil, Sharpie Fine Pen; occasional use of Pitt Brush Pens; commercial letter and number stamps; StazOn pigment stamp ink. When the month is completed it will be bound as a book with a spiral coil. Like everybody else in the world I have a large number of paintbrushes, chopsticks, skewers and other miscellaneous objects in a coffee can. I keep it in a corner on my tiny 1950’s kitchen counter. Since my “cooking” techniques take up very little space and my art making practice has a tendency to spread and has taken over the kitchen it is the logical place to keep it. 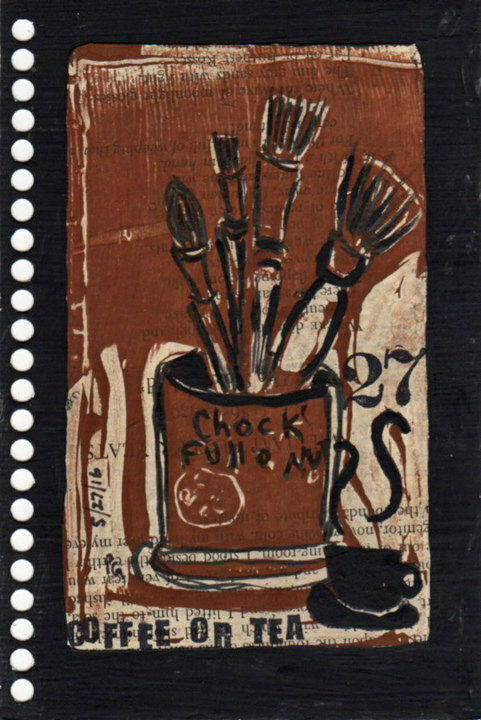 I got the bright idea to draw the paintbrush filled coffee can as a monotype using the dark field method on the Gelli plate. I was curious how it would work and had visualized a very intricate drawing such as I am able to produce on a copper plate. I decided to use the small 3″x5″ plate. Ha! It didn’t take long for me to realize that no super drawing was coming from me that day. Everyday in May 2016: Drawn from direct observation on a Gelli Plate using the Dark Field Method and acrylic ink. Black Pitt Brush Pen; hand carved coffee cup eraser stamp; commercial letter and number stamps; StazOn pigment stamp ink. When the month is completed it will be bound as a book with a spiral coil. I had to refer to a Google photo for this since I didn’t want to encourage any bugs to hang around me. It’s better if they don’t think I have put down a welcome mat. commercial letter and number stamps; StazOn pigment stamp ink. When the month is completed it will be bound as a book with a spiral coil. Things contained in glass. 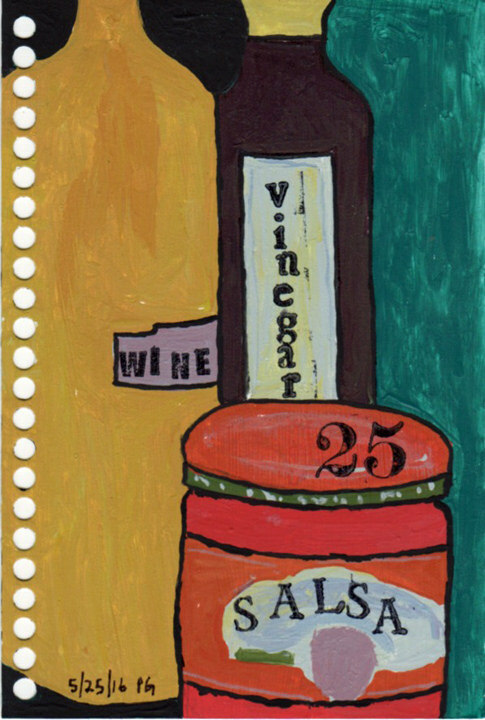 Wine, vinegar and salsa sounds like the makings of some kind of meal if I were the kind of person who actually had a clue. I have no idea why I possess a bottle of vinegar and the wine has been living in the bottom of the fridge since 2003. The shop didn’t have any cherries. He said “soon”. While I was wandering the uncountable galleries and halls of The Met I happened upon an engraving by Albrecht Dürer, one I had seen before but apparently ignored, which included a stag, horse and dogs. Just what I was looking for – a pet. I stood before it in the sparsely populated gallery and, paying close attention, sketched. 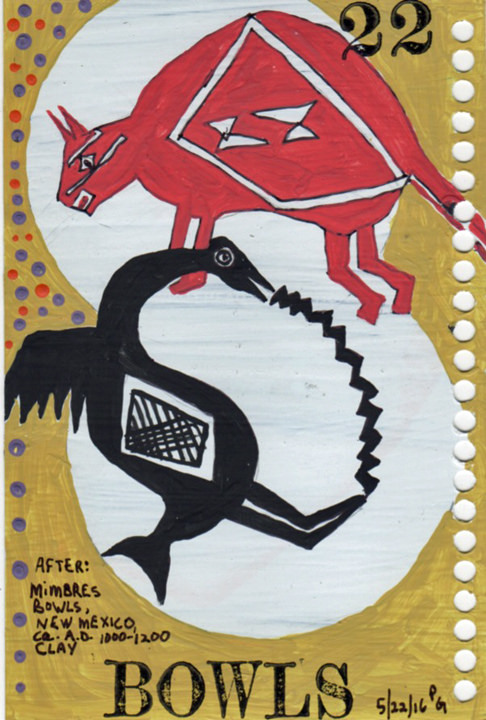 Everyday in May 2016: Drawn from direct observation of the original artwork while in The Met, color added later at home. Materials vary. 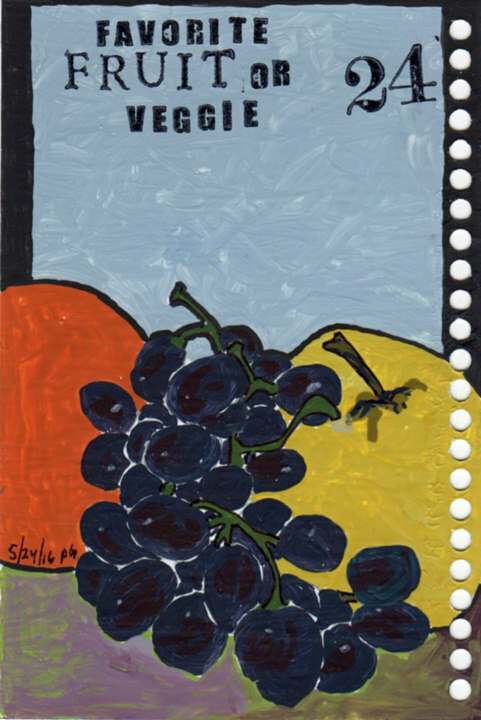 Acrylic paint; pencil, Sharpie Fine Pen; occasional use of Pitt Brush Pens or gouache or Caran d’Ache Neocolor crayons; commercial letter and number stamps; StazOn pigment stamp ink. When the month is completed it will be bound as a book with a spiral coil. These were the designs inside the bowls that I found in the Smithsonian’s NYC American Indian Museum. The bowls were way more interesting than anything in my cabinets and I avoided ellipses by ignoring them. Everyday in May 2016: Drawn from direct observation of the artwork while in the American Indian Museum, NYC. Materials vary. 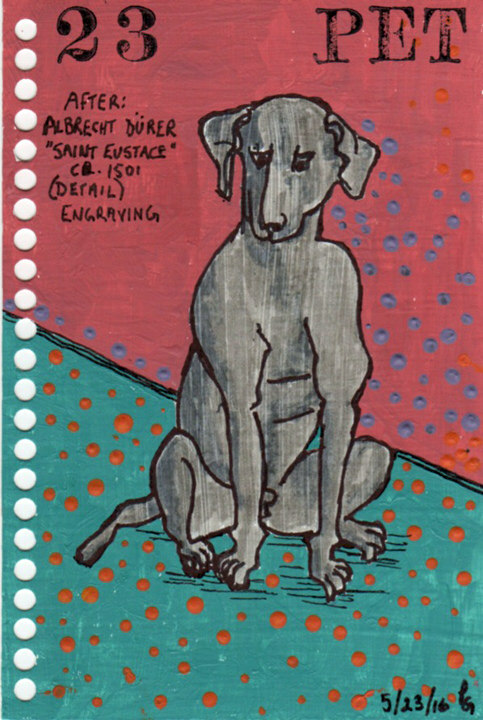 Acrylic paint; pencil, Sharpie Fine Pen; occasional use of Pitt Brush Pens or gouache or Caran d’Ache Neocolor crayons; commercial letter and number stamps; StazOn pigment stamp ink. When the month is completed it will be bound as a book with a spiral coil.